I went to Ethiopia in July, ostensibly to see my girlfriend Elaine and the “normal” tourist sites. But it’s hard for me to go anywhere and fully turn off my hardware brain. So while Elaine was at work, I spent my days talking to folks and exploring what I could of developing manufacturing ecosystem of this country. 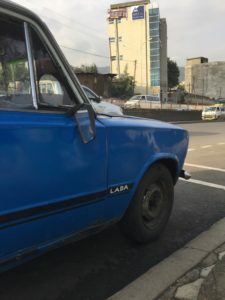 Below are some of my takeaways from my time in and around Addis Ababa. Recently there have been reports of Ethiopia as the “China of Africa” – a future potential manufacturing hub for the region and world. The primary driver here is Ethiopia’s population, which at over 100 million people makes it one of the largest and most densely populated countries in Africa. The comparison to China is also apt in that, emerging from communist rule as late as the 1990s, Ethiopia has relatively low income inequality and crime rates and as such is regarded as a safe country. And now with Prime Minister Abiy Ahmed’s election, there is hope that the country can continue to take strides. This said, despite all this hope and progress, getting off a plane in Addis Ababa today is a very different experience from my life in Shenzhen. If the Chinese currency regime was playing on hard, then Ethiopia might be expert. The Ethiopian Birr is nominally pegged to the US dollar, currently at a rate of 27.78 birr/USD. However, there is a vibrant black market in currency, where a dollar goes for up to 30% more birr. At a street level this is operated by boys asking if you want “change”. This is illegal, and enforcement is supposedly stepping up under the new prime minister. On a macro level, Ethiopia struggles with foreign exchange shortages and maintaining its trade balance – currency through official channels can simply be unavailable to traders or travelers. As such, “Forex” can be a key word in terms of opening doors to a new venture in the country. Another wrinkle to Ethiopian business is that, since the independence of Eritrea, it has become a landlocked country. With Eritrean tensions ongoing, the primary port of available to Ethiopian trade is in the tiny nation of Djibouti. I wasn’t able to make it to Djibouti, but from what I heard the port is a tough place, rife with bribes and stolen cargo. Things are so bad that folks are considering a new port in Berbera, Somalia (at least twice as far from Addis, and, well, Somalia) as a viable alternative. Similarly, after the reopening of diplomatic relations between Ethiopia and Eritrea this summer, the first order of business for the Ethiopian side has been regaining access to Eritrean ports. 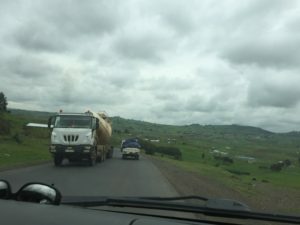 Apart from the new Chinese-sponsored highway, Ethiopian roads are bad. Main thoroughfares for the nation are comparable to narrower two-lane American roads. In some spots potholes have simply become the road, with traffic slowing to either go around or bounce through the mud holes. In some cases violent wrecks lie blocking part of the road, likely caused from combination of steep grades, poor road maintenance, non-roadworthy vehicles, and reckless driving. 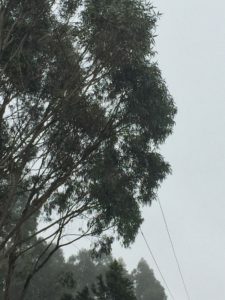 Tough to see, but that is a tree sitting on a bare wire conductor. Seemingly permanent. Power goes out a lot. If your girlfriend isn’t staying in the Hilton, this could be a problem. A big hydroelectric dam, potentially the biggest in Africa, is underway but rumored to be behind schedule and out of money. During my visit, the lead engineer was murdered a couple blocks over. Not good. One bright spot for Ethiopian transport is Ethiopian Airlines. It is a truly global airline, with flights to most African cities of note and intercontinental hubs (my flight to Hong Kong boarded next to a flight to Washington DC). 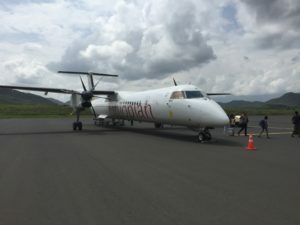 With the right promo codes, Ethiopian also offers domestic flights from Addis to most cities and towns in Ethiopia for around $60 USD each way. This effectively covers challenges in road transport for the well-to-do. This airline struck me as a unique resource for Ethiopia. The main manufacturing industry in Ethiopia is textiles. This industry combines Ethiopian raw materials such as leather with cheap labor. But I’ll have to believe their reports as I didn’t have a portal into this world past the souvenir shop. As far as I could tell, most non-agriculture (e.g. coffee), non-textile activity is focused on construction. Addis Ababa is experiencing a building boom. The underlying forces driving all this expansion may be a little unclear (at least on the surface Addis doesn’t seem like a city in need of much more commercial or residential real estate), but its execution is certainly interesting. The skyline is dotted with 10 story cinder block shells. The logic goes that you complete the first few floors as retail space, and then use your profits to complete the rest of the construction. Not necessarily pretty, but definitely an interesting business model. Industries have sprung up in support of this boom. Aluminum and glass operations can be seen throughout Addis. 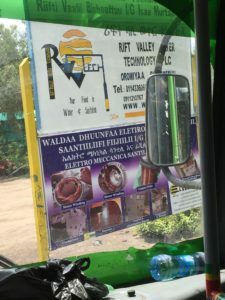 Ethiopia now manufacturers its own rebar, albeit with imported steel – I found this out when the mini-bus I was riding in broke down in front of the factory. But if it’s any indication of the state of industrial development, this factory has hosted several Ethiopian elites, including the previous president. From there though, not a lot. As far I could see, no metal machining, stamping, casting, or coating, no injection molding, almost certainly no circuit boards. South of the primary industrial zone, I did see a sign for a motor rewrapping shop, which fits the resourcefulness and ingenuity I’ve seen in other spots on the continent. But the supply chain, at least the parts we most often focus on in our work, seemed weak if non existent. A hardware business in Ethiopia would be heavily dependent on imports. The going wage for an Ethiopian factory worker is $80 a month. A college graduate can be employed for $175 a month. A day laborer on a construction site in Addis Ababa is 80 birr, or a little south of $3 a day. I was stunned by this. While we think of China as a source for low cost labor, these wages are about eight to ten times less then their Chinese equivalents, and obviously even more compared to Western countries. This didn’t strike me as entirely a positive – can you trust someone when the value of the tool in their hand may be greater than their monthly income? I’d like to think my strategy would be to favor higher than market wages, in hopes of inspiring loyalty and commitment, and simply improving lives. But such labor costs would almost certainly change calculations for a new venture. The Chinese presence in Ethiopia is endlessly fascinating. 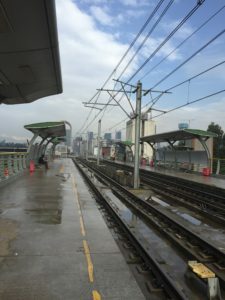 Construction projects may be the most obvious piece – new skyscrapers for the Addis skyline built by Chinese construction companies. The new light rail network is managed by my hometown Shenzhen Metro Group. A pristine six lane highway leads south out of Addis to the Dukem Industrial Zone – home of the aforementioned East Steel PLC – where all signs are first in Chinese. The halls of the Ethiopian Investment Commission seem to have more Chinese than Ethiopians. There are Chinese restaurants in Addis Ababa where the Ethiopian waitresses speak remarkably good Mandarin. The Chinese sporting goods store Decathlon seems to have opened an office in Addis, perhaps exploring a world where brand-name Chinese companies sell directly to Ethiopian consumers. 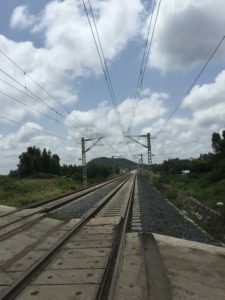 Rail lines, substations, dams – the list goes on. 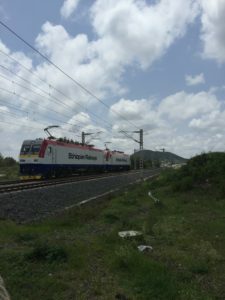 The new rail service to Djibouti, with financing from Beijing. Photo taken south of Addis. And here comes the train! The Chinese influence has also entered Ethiopian culture – during my time in the streets of Addis people would yell “China” at me as a sort of greeting and acknowledgment. 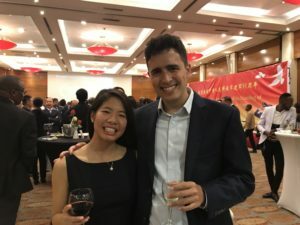 “China” has become a stand-in for all foreigners. Elaine and I had a chance to observe Chinese soft power in Ethiopia first hand at the Addis Ababa celebration of 91st anniversary of the founding of the People’s Liberation Army. From military commanders to diplomats, journalist, and aid workers – Ethiopian, African, and from overseas – it seemed folks were there to acknowledge the new leader in Africa, and for the free drinks. If starting a business in China is hard, then starting a hardware focused business in Ethiopia would be much much harder. Broken infrastructure, red tape, security, and dependence on imports would be all big challenges. But if able to cut through, you could not only take advantage of low labor costs, but occupy a key piece of the industrial economy, with prime access to underserved markets both domestically and across Africa. I imagine focusing on an industrial process – machining, molding, casting – could be a way to carve out a niche in the evolution of African manufacturing. Easier said than done. 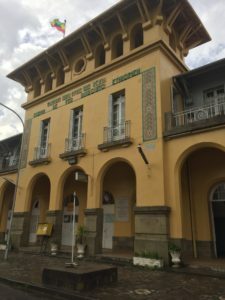 Leaving Ethiopia, I found myself wanting to look more into the history of Chinese manufacturing. How have countries gone from primarily agrarian, anti-capitalist societies to advanced, competitive, industrial powerhouses? What is a common order of events, and what do countries like Ethiopia need to do to take the next step? While Chinese motivations in Ethiopia are likely complex, the comparison between modern Ethiopia and China of decades past certainly creates common ground. Thanks to Koen Maaskant of the Ethiopian Investment Commission and Sean Keough of EQUS Global for taking the time to talk me, and as always to Elaine. You can reach me at gordon@pivo.tc .